Hey guys earlier we have discussed about Movie Box and best Cydia sources for Movie Box. For those who haven't used Movie Box, it is a free movie streaming app. By installing Movie Box you can watch movies and TV series for free. Movie Box works fine on iPhone, iPad or iPod having iOS 8, iOS 8.1.1, iOS 8.1.3, iOS 8.1.2, iOS 8.2, iOS 8.3, iOS 8.4 and iOS 9. It also works on iOS 7.x version, you can try it if you are still using the older iOS versions. But with the upcoming newer versions of iOS Apple is making it more and more difficult for TaiG and Pangu teams to release jailbreaks. Hence the need for apps that could be installed without jailbreak is also trailing. 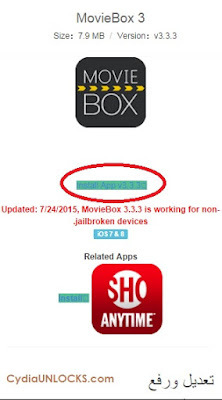 Here I have discussed some methods by which you can install Movie Box without jailbreak (2015). Step 1 - First, go to your "Settings" option and then "General" -> "Date And Time"change the date in your iOS device to July 1, 2014. Step 2 - We will download and install Movie Box using the Othman's link. So open this link in Safari browser. Othman's Link for Movie Box - http://ipa.othman.tv/ipa/mbox.php. but it is less frequently updates and hence you will not always get the updated versions. But one positive point is that this page is in English. So you can actually read what is written on the page. Step 3 - Now tap on the "Install App v3.3.3" button in green color. Actually this page is in Arabic. So it would be difficult for you to read any other content present there. But you can use a translator if you wish to read any other information. Step 4 - Once the Movie Box setup is installed on your iOS device. Just tap on it to open it. And finally install Movie Box on your iPhone/iPad/iPod. This was it. If you have followed the steps Movie Box would have successfully installed on your iOS device. Also see - Pandora downloader not working? Step 1 - The first step is the same. You have to change your iOS device's date to 1 July, 2014. For this go to "Settings" -> "General" -> "Date & Time". And change the date from "Set Automatically" to 1 July, 2014. Step 2 - Go to this below mentioned URL using the Safari browser in your iPhone/iPad. This link will make you land on vShare's official homepage where you will see two downloadable versions of vShare. One is for unjailbroken devices and other for jailbroken devices. Step 3 - Choose the unjailbroken version of vShare and download it. 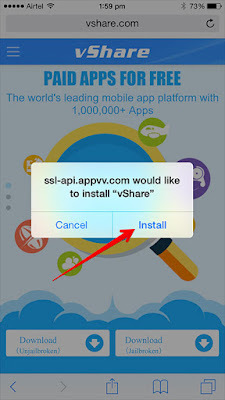 It may show you a warning message as "ssl-api.apvv.com would like to install vshare". Tap on "Install" button and install it. Step 4 - Now go to your iOS device's homescreen. You will see vShare start installing vShare (without jailbreak 2015) version being installed on your iPhone/iPad. Let it finish. Step 5 - Now open vShare and you will see a "search box" on the homescreen. In the box, search for "Movie Box iOS 8.x" i.e for Movie Box with your iOS version. Step 6 - Select the result and download it. This is just the setup that is being downloaded. Once it is finished download you have to run it to install Movie Box. Step 7 - You will find the downloaded file with the vShare downloads. 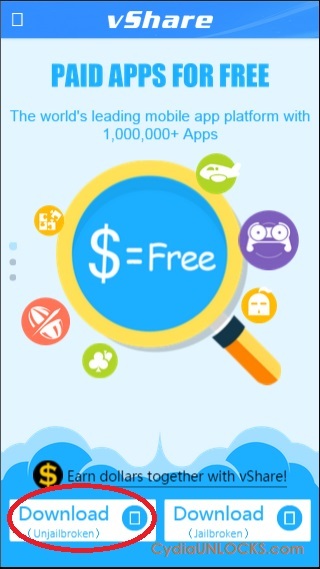 Tap on the downloaded file and run it. Once the installation is successful you will see a Movie Box icon on the homescreen. Open it and enjoy the movies! Movie Box is now installed on your iOS device. Also see - How to install vShare Cydia version? So these were the two methods to install Movie Box without jailbreak (2015) on your iPhone, iPad or iPod. Just use them and do comment if you face any trouble. Enjoy!